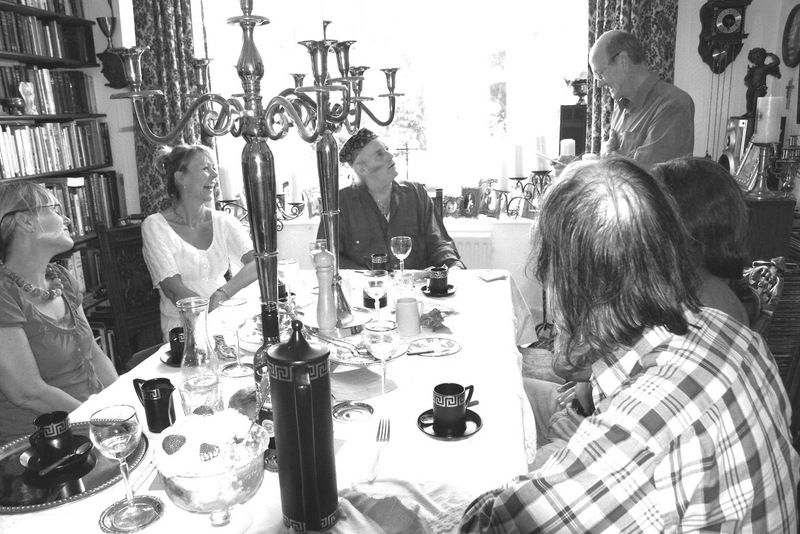 A toast is proposed at an informal dinner party with friends of the bishop. Tony Hill attended an informal dinner party in the summer of 2009 hosted by Bishop Seán Manchester and his wife at their spacious retreat on the south coast of England. 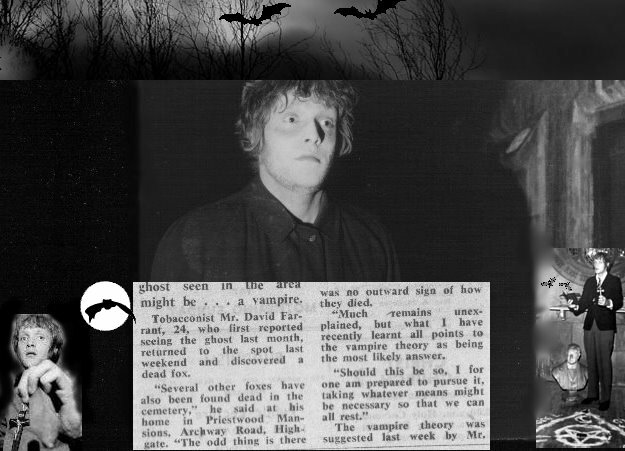 Some of the guests were also members of the Vampire Research Society fascinated to hear what Mr Hill might have to say about David Farrant (whom Mr Hill allowed to live in the cellar beneath his Archway Road flat from August 1969 to August 1970). Mr Hill referred to Mr Farrant as "Farrow" throughout his after-dinner talk. This was the pseudonym adopted by David Farrant when he was arrested by police searching for black magic devotees at Highgate Cemetery in August 1970. John Bradish stood bail for Mr Farrant and allowed him to stay at his Barnet home as a condition of bail. What Mr Bradish did not bargain for was Mr Farrant's vindictive nature. Mr Bradish had apparently made a pass at Mr Farrant's wife a couple or so years earlier and, as Tony Hill recounted, revenge was in the air. Tony Hill reveals everything about events as far back as 1969. 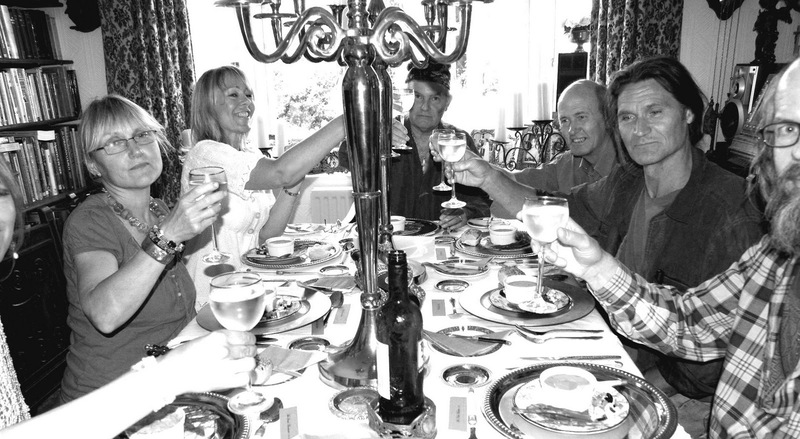 The select group of dinner guests enjoyed a five course meal from a varied menu which also catered for those who are vegetarian. Mr Hill is one of the latter, but his speech to those assembled as coffee was served contained rather more red meat than vegetable fayre. He stood to deliver his talk, occasionally glancing at prepared notes, to recollect times gone-by when he worked part-time at Bishop Seán Manchester's photographic studio darkroom until he absconded with a barmaid called Mary to the west country. When he returned to London without Mary six months later, the photographic studio was closed due to its lease having expired. Mr Hill lost touch with his former employer for a while, as that man was now engaged in the full-time investigation of the case of the Highgate Vampire. Mr Hill surprisingly offered his vacant coal bunker under Archway Road to the cuckolded husband of the barmaid with whom he had enjoyed a brief interlude. This man had become homeless due to eviction and bankruptcy. The barmaid had returned to her parents in Southampton with two young infants in tow. The cuckold, of course, was David Farrant. It was in the winter of 1969/70 when Mr Farrant suggested to Mr Hill they attempt to hoax a ghost story to see what the public reaction might be. Mr Hill went along with Mr Farrant's idea, but had lost interest by the end of the year. In the pubs he frequented, Mr Farrant heard tales of a vampire reputed to haunt Highgate Cemetery and wanted to see how easily it would be to convince local residents that there was also a ghost in the vicinity. Mr Hill photographed Mr Farrant wearing "ghost" make-up at night in the graveyard. He was also privy to Mr Farrant using the addresses of acquaintances such as Nava Grunberg, Kenneth Frewin and Audrey Connely to submit fraudulent letters to local newspapers. It was always Mr Farrant's intention, Mr Hill revealed, to eventually expose the "ghost story" as a hoax to show how gullible the public are when it comes to things paranormal, but events overtook this plan as the terrifying reality of an emerging supernaturalism eclipsed David Farrant's asinine antics. Meanwhile, Mr Farrant was quickly becoming addicted to the attention he was starting to receive in the press. By the end of the year, he was evincing all the symptoms of a compulsive publicity-seeker. These symptoms would stay with him for the rest of his life. Tony Hill stands to give his talk to the assembled dinner guests. Mr Hill stood as he gave a long talk about events which occurred four decades ago. He recounted the assault occasioned by John Bradish on the bishop at the entrance of the Society's headquarters in Holloway Road and how most people, including Mr and Mrs Bradish, soon became aware that Mr Farrant was entirely responsible for the black magic telephone calls to Gillian Bradish which triggered the attack. Mr Hill and others overheard Mr Farrant in the Prince of Wales pub boasting of making the calls on the evening of the day Mr Bradish was convicted of assault in court, and Bishop Manchester was unjustifiably bound over to keep the peace due to accusations levelled against him in the dock by defence witness Gillian Bradish. Such incidents made Mr Hill realise that Mr Farrant was someone to avoid like the plague. By now Mr Farrant was residing at the home of Mr and Mrs Bradish in High Barnet, having previously been arrested at Highgate Cemetery on 17 August 1970 and subsequently held on remand at Brixton Prison until Mr Bradish stood bail for him. David Farrant never returned to his coal bunker dwelling under the ground floor flat of Tony Hill, and Mr Hill had little more to do with Mr Farrant following the well-publicised graveyard arrest. Up until August 1970, Mr Hill had photographed Mr Farrant in the catacombs, vaults and among the graves at Highgate Cemetery. In these pictures Mr Farrant is either holding a rosary, or a cross and stake. Following his infamous trials at the Old Bailey in June 1974, Mr Farrant claimed that one man alone could prove his innocence because he took the incriminating photographs of him and knew they were posed where damage already existed prior to Mr Farrant's interloping. The same man also knew that Mr Farrant was only pretending to do what he claimed for the sake of publicity. David Farrant gave this person the pseudonym "Hutchinson" and falsely described him as a "journalist" to the media and the courts. "Hutchinson," of course, was Tony Hill whose photographs of Mr Farrant in the terrace catacombs were discovered by police at Mr Farrant's home and contributed to his conviction for malicious vandalism. David Farrant could not afford to allow Tony Hill to come forward if he wanted to retain any semblance of credibility because, more than anyone else, Mr Hill knows that Mr Farrant is a charlatan. He still possesses secretly recorded tapes of their conversations from early 1970 to prove it. On these tapes, Mr Farrant can be heard conspiring to hoax a ghost story using acquaintances' addresses to send fraudulent letters to local newspapers, and by dressing up as a "ghost" while wearing make-up for photographs. Statements made in the press and magazines such as Time Out and City Limits by Mr Farrant that he wanted "Hutchinson" (aka Tony Hill) to come forward to "prove" his innocence are, therefore, disingenuous from start to finish. No less phoney is Mr Farrant's published claim that he did not know where the man he sought resided. He knew exactly where Tony Hill lived. It was just a short bus ride from where Mr Farrant lived in Muswell Hill. The last thing Mr Farrant wanted was for anyone to discover the whereabouts of Mr Hill who would have not hesitated in blowing the whistle on the impostor. Hence the pseudonym "Hutchinson" employed by David Farrant when describing Tony Hill. Three months later, David Farrant met Bishop Seán Manchester at Highgate Cemetery, as recorded on the front page of the Hampstead & Highgate Express, 6 March 1970. It was not long before Bishop Seán Manchester was advising caution where Mr Farrant's claims were concerned, and by the end of that year he had publicly dissociated himself from Mr Farrant on a television programme (BBC's 24 Hours, 15 October 1970) and in both the national and local press. Mr Farrant immediately sought revenge which manifested in the Bradish incident and ensuing case which found a smug David Farrant seated in the court's public gallery with a massive grin on his face, followed by a malicious vendetta against Bishop Manchester which continues to this day. David Farrant never fails to get everything wrong when he makes public pronouncements about anything to do with the bishop. Nobody shown in the above images are related to Bishop Seán Manchester or indeed Sarah Manchester. Mr Farrant knows none of these people with the exception of Tony Hill who, ironically, was Mr Farrant's "side-kick in publicity-seeking" from 1969 until 1970. Mr Hill is quite open about this fact. As for being Bishop Seán Manchester's "side-kick," Mr Hill, who had little contact with the bishop after the 1960s, nowadays resides in another country and only ever comes into contact with his old employer at reunion dinners such as the one described. These (mostly informal) dinners are held regularly, but with different groups of people who usually know one another. It is curious how Mr Farrant failed to recognise the FoBSM member who ripped a roll of film out of the back of his camera at the Festival of Mind, Body and Spirit held at Alexander Palace, London, in 1981 when David Farrant was secretly trying to photograph Bishop Seán Manchester who was standing in another part of the exhibition. Mr Farrant's second wife, Colette Sully, attacked the FoBSM member from behind as her husband struggled to retrieve his camera. But to no avail. This loyal friend of the bishop (seen seated next to Tony Hill in the photograph at the top of the page) succeeded in preventing Mr Farrant from gaining material to further his puerile campaign of disinformation and black propaganda. 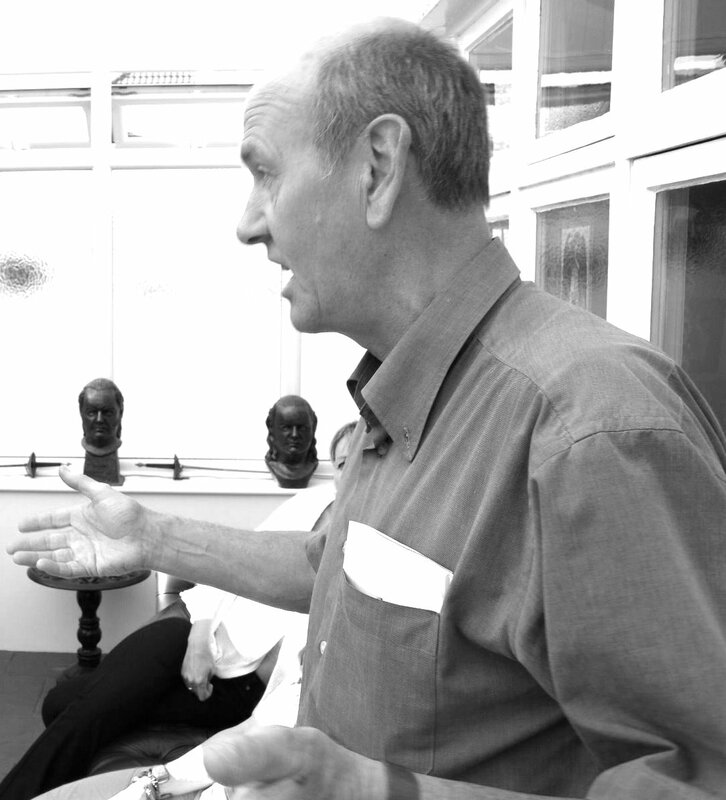 Tony Hill's after-dinner talk did not concentrate solely on David Farrant. Far from it. Mr Hill also reminisced about the period when he knew and worked for Bishop Manchester in the 1960s, plus various people from subsequent decades. Mr Farrant was merely one of those characters. Not an unimportant one from Mr Hill's perspective because of his romance with Mary Farrant in the late 1960s. Many other people were referred to in Mr Hill's speech, and Mr Farrant's name was not mentioned by anyone else who spoke at the table. The others, like Bishop Seán Manchester, nowadays find Mr Farrant completely irrelevant. They were nevertheless interested to learn what Tony Hill had to say about the man he cuckolded and then conspired to hoax a ghost story with forty odd years ago; a man, moreover, who ever since has tried to make a career out of riding on the coat-tails of the bishop by pretending to be a vampire hunter, pretending to be a member of a Society involved in the investigation of the Highgate case, and pretending to be part of that investigation. When that failed, David Farrant pretended to be a witch with theatrical stunts more resembling diabolism.